An email client is a computer program that is used to manage its user’s email. Microsoft Outlook is one of the most widely used email clients. 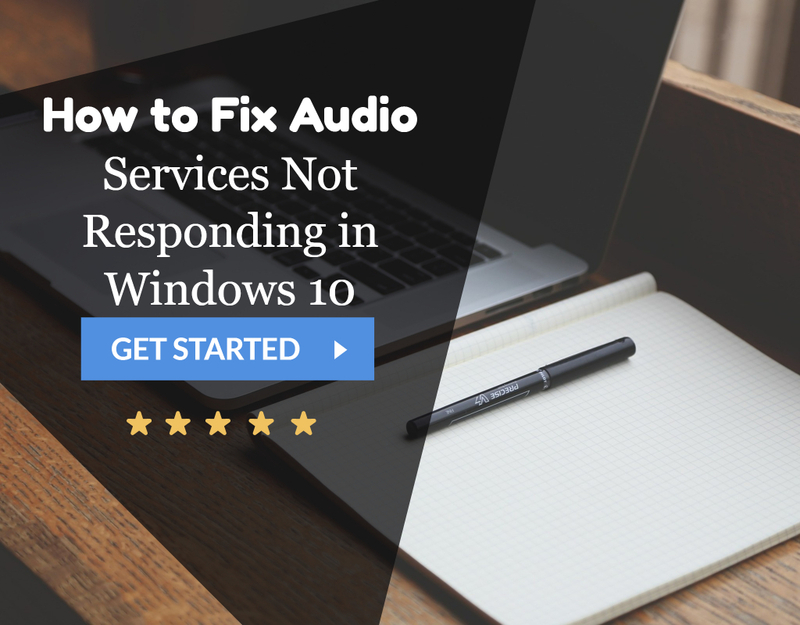 It is popularly used by many corporate organizations as well as naive users. 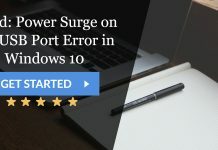 It comes along with the Microsoft Office suite, and if you do not have that, then there is no need to worry as it also comes as a separate application. If you’re using Microsoft Outlook, then it is undeniable that you might come across many errors that this application throws. Out of all those errors being thrown, one of the most common errors is 0x8004010F: Outlook Data File Cannot be Accessed. Just keep on reading to find out your solution. Although the users of Microsoft Outlook application are extensive in number, most of them are very much annoyed by the errors thrown by it. Most of you, the users of Microsoft Outlook, would have come across the 0x8004010f: Outlook Data File Cannot be Accessed error. There might be several questions rolling in your mind related to this error. This article is going to answer all those questions. The reasons for this error to occur and the ways to fix it too are mentioned in the following article. 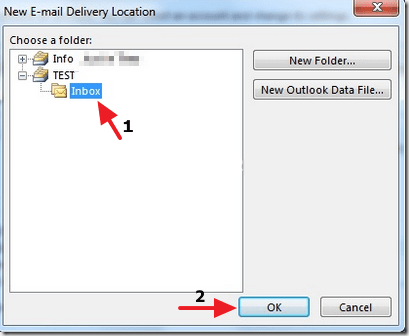 When Does Error 0x8004010F: Outlook Data File Cannot be Accessed Occur? The error generally occurs while sending or receiving any emails. It is a very common Messaging Application Program Interface (MAPI) error. The error might also occur during synchronization of an Offline Address Book (OAB). It can also happen while downloading OAB files. You are most likely to receive this error when you are performing a send/receive operation on a mail. The error might look like below. Why Does Error 0x8004010F: Outlook Data File Cannot be AccessedOccur? 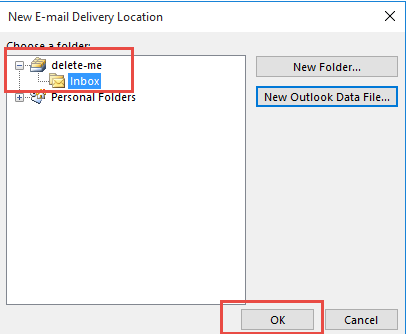 In Microsoft Outlook, when connected to the Exchange Server, all the data related to mails is stored in the Offline Storage Table (OST) file. This OST file helps the user’s work to continue even if the server is down. The changes are reflected in the OST temporarily and then back to the Exchange Server, once the server becomes active again. The Outlook Data File Cannot be Accessed error might occur because of the reasons mentioned below. Your Outlook profile has corrupted. 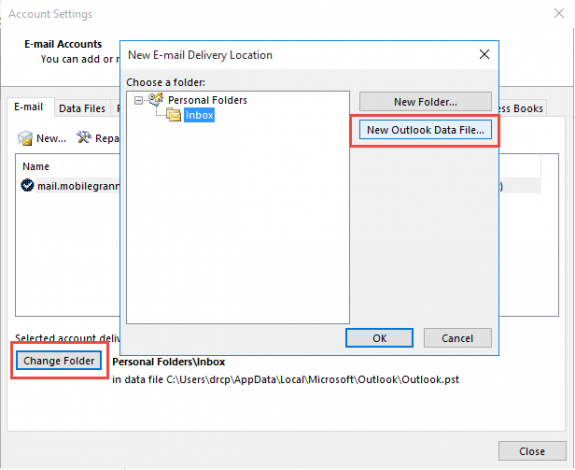 Outlook folders’ location (.PST file’s location) in the drive has been changed. 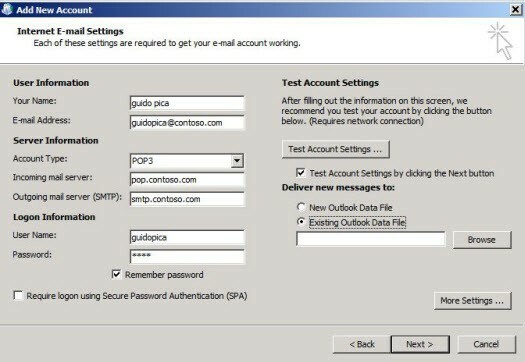 However, Outlook Profile might not configure correctly. The old OST file might be being used even after upgrading to a newer version of Outlook. The Personal Storage Table (PST) file might be misconfigured. Now we know the reasons for the error. So, now all we would need is some method to resolve this error and stop being annoyed by the error. 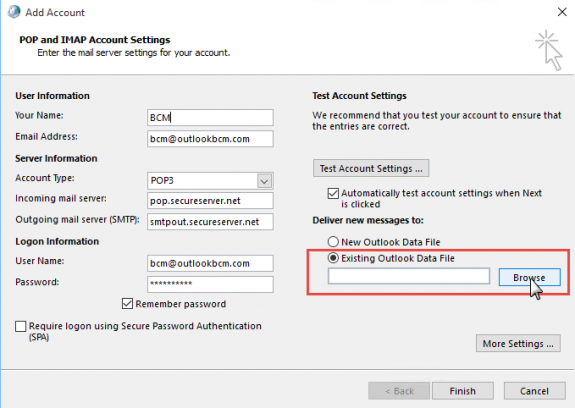 How to Fix Error 0x8004010F: Outlook Data File Cannot be Accessed Error? The 0x8004010F: Outlook Data File Cannot be Accessed error hinders you from sending or receiving any mail. So, solving this problem should be a primary need. If you come across this error message frequently, there exist some solutions to resolve it and the following methods describe the ways to do so. 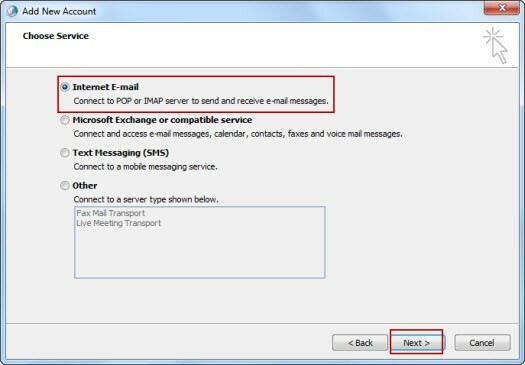 If you are using the 2010’s or 2013’s version of Microsoft Outlook, all you need to do is create a new Outlook profile by using POP3 or IMAP email account. There is a different solution for both types of users. Follow these steps to create a new profile. 1. At First, launch Microsoft Outlook application in your system. 2. Then navigate to File>Account Settings. 3. Afterwards, a dialog would open up. Click on the Email tab on that dialog box. 4. Then select the account in which you are receiving the error message. 5. Click on the Change Folder button. 6. Now, New E-mail Delivery Location dialog would open up. Afterwards, click on New Outlook Data File… button. 7. Afterwards, provide a name to this new Outlook data file (e.g. “TEST“) and then click on OK.
8. Now expand this new data file (e.g. “TEST“) and select the Inbox sub-folder. After that click on OK.
9. Now, get back to the Account Setting dialog box again. Click on Change Folder button again. 10. This time, simply, select the correct data file & folder where you want to store your emails. After that, click OK.
11. Now close the Account Settings dialog box and then click on Send/Receive button. You are good to go. This would fix 0x8004010F: Outlook Data File Cannot be Accessed error. The account can set up automatically as well as manually. 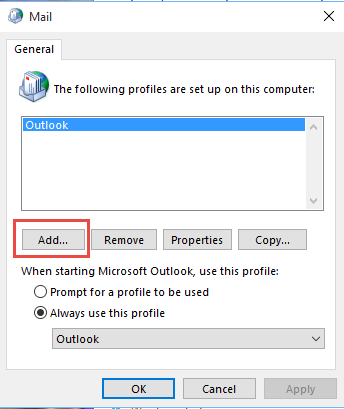 Follow the steps mentioned below to create a new Outlook profile in Outlook 2013. 1. First of all, navigate to the Control Panel. 2. Then click on the Mail in the list. 3. 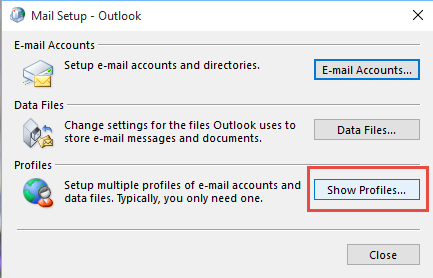 On the Mail Setup – Outlook dialog box, click on Show Profiles button. 4. Afterwards, a Mail dialog box would open up. Click on the Add button in the General tab to create a new profile. Enter a new name for this new profile that you want to create and then click on OK. Once the profile is create with a unique name then simply delete the old one. 6. Now, use Auto Account Setup option to add a new account to your profile. Or type a new profile name in the new profile dialog box & hit OK. 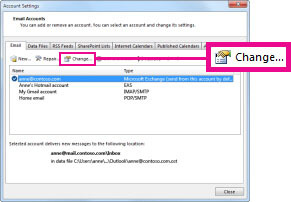 Enter valid email address & account information in the Add new account box. Press Next. 7. 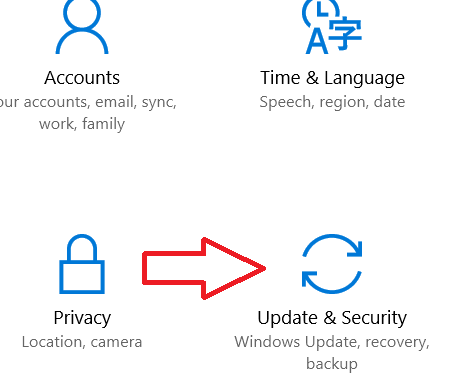 If you’re using POP3 then you need to tick on the change account setup option. You can use old PST data file using this option. Now, just click on Next button. 8. Then select the old data file & exit from the dialog box. 9. Afterwards tap on Next once your account is successfully configured. 10. Finally, restart the Outlook. 1. At First, go to the Control Panel. 4. A Mail dialog box would open up. Hit Add button in the General tab to create a new profile. 5. Afterwards, enter a new name for this new profile that you want to create and then click on OK.
6. 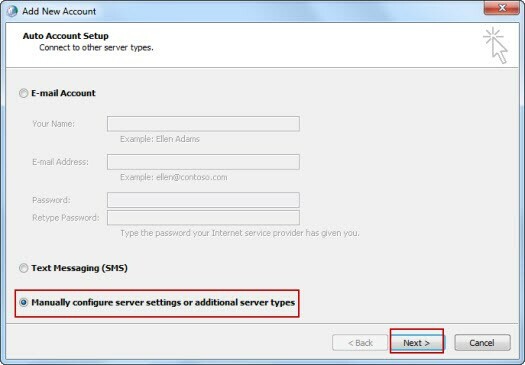 Select Manually configure sever settings or additional server types & click on Next to proceed further. 7. A new dialog box named as Choose Service will open. Select Internet E-mail from it & click on Next. 8. 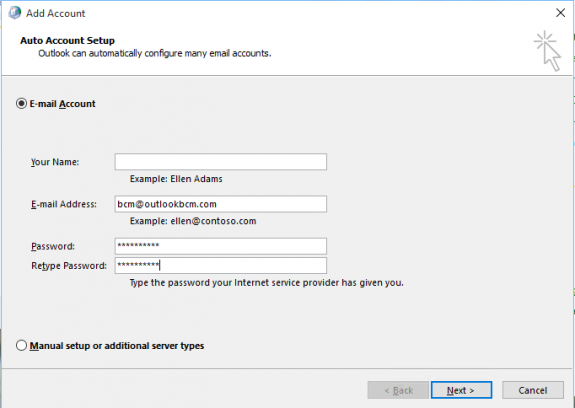 Type your email account settings in Internet E-mail Settings dialog box. 9. Then, click on Text Account Settings… to test your account. 10. Now, select Existing Outlook Data Files & click on Browse. 11. 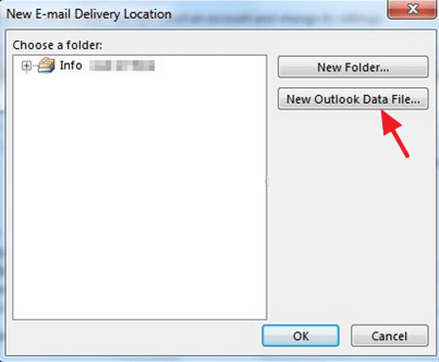 Afterwards, select the Outlook data file that you previously located & click on OK.
12. Hit OK & close test account settings dialog box. 13 At last, click Finish. Whether you follow the manual process or the automatic one, the above steps will create your new profile for Outlook and then, you need to set up this new profile. The steps mentioned below will help you to set the newly created profile as a default profile. Navigate to General tab on the Mail dialog box. After that, choose the Always to use this profile option and select the profile that you just created. Press Apply button and then click on OK button. Close the dialog box and you are good to go. Some users of Microsoft Outlook may have more than one email accounts in Outlook and so, creating a new profile may not be a feasible solution for them. But resolving the Outlook Data File Cannot be Accessed Error is a need for them too. Such users should follow the steps mentioned below. 1. 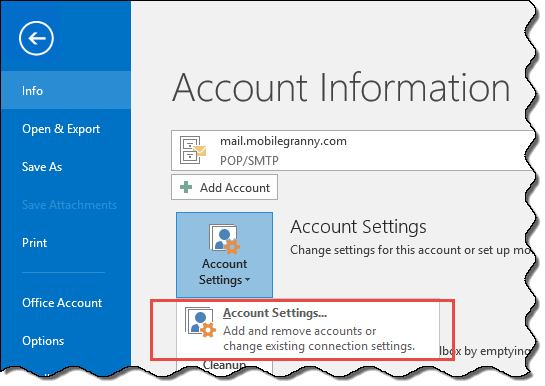 Navigate to File>>Info>>Account Settings>>Account Settings in Outlook application. 2. Then go to Email tab & highlight the account with the issue. Now, click on Change folder option. 3. 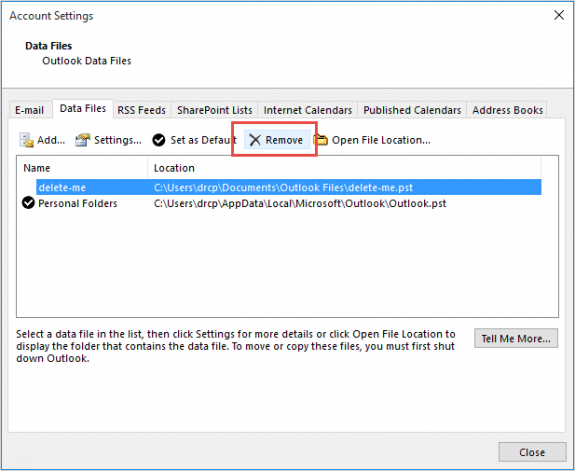 Then click on New Outlook Data File… & create a temporary data file. 4. Afterwards, provide any name to this file & hit OK.
5. Expand this file & select sub-folder Inbox. Press OK & go back to Account Settings. 6. In the Account Settings, click on Change folder again. 7. After that, select the correct data file & folder that you need for your emails. Press OK.
8. At last, switch back to the data files & remove Temporary PST file from there. 9. Close the dialog box & click Send/Receive option. Most probably this would resolve 0x8004010F: Outlook Data File Cannot be Accessed issue. Follow the steps mentioned below to disable the antivirus from your system. 1. 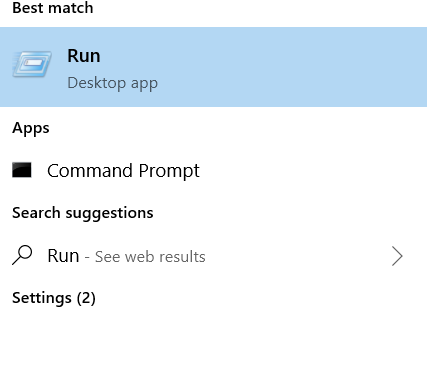 Click on Start Menu and type “Run” in the search box or simply press Win Key+R as a shortcut. 3. However, windows Firewall will pop-up. 4. 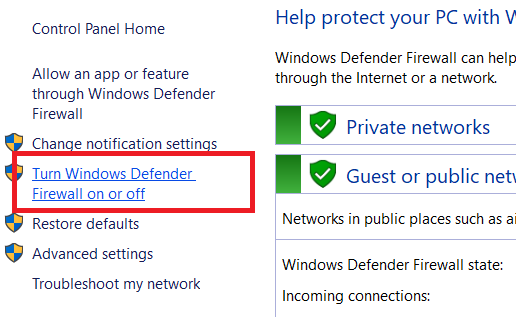 From the left pane of the menu, click on Turn Windows Defender Firewall on or off. 5. 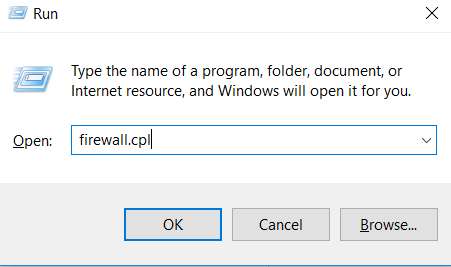 After doing so, under the Public network Setting choose Turn Off Windows Defender Firewall and press OK.
Make sure that you follow the steps mentioned above only if it is the only option because turning the Firewall off affects the security of your system. 1. At First, press Window Key+R to open Run. 2. Then type “cmd” in the search box and hit OK.
3. 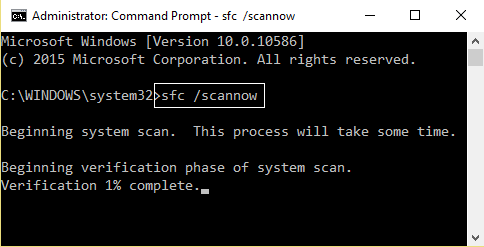 Afterwards, type the following command, “sfc /scannow” (Without quotes) in the Command Prompt and press Enter. 4. Then wait for a few minutes. However, the System would perform the required repairs automatically. 5. After that, reboot your system and 0x8004010F: Outlook Data File Cannot be Accessed is solved. 1. At First, go to the Settings App and select Updates & Security option. 2. 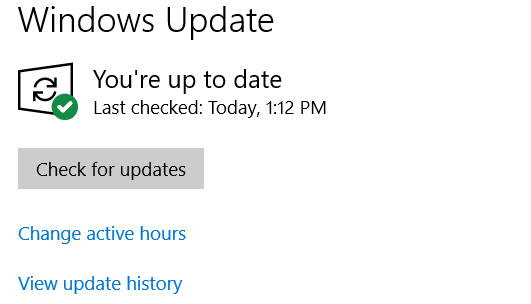 After that, go to Windows Updates and to check if there are any updates available, click on Check for Updates option. 3. Afterwards, install the updates if there’s any available. 4. Once the updates are done, reboot your system. 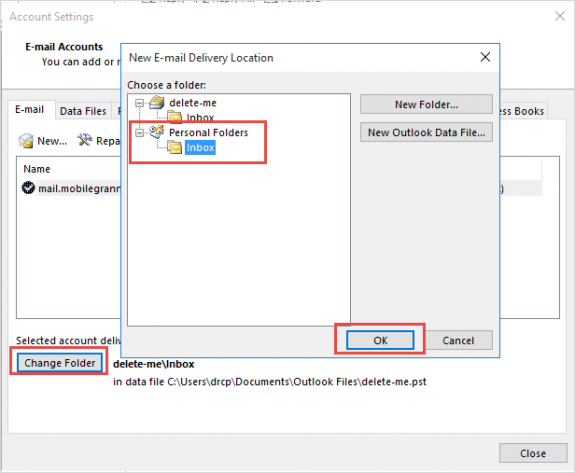 One of the reasons for Outlook Data File Cannot be Accessed error might be that there is some problem with the Outlook file. However, the solution to this can be to repair that file. For doing so, follow the steps mentioned below. 1. 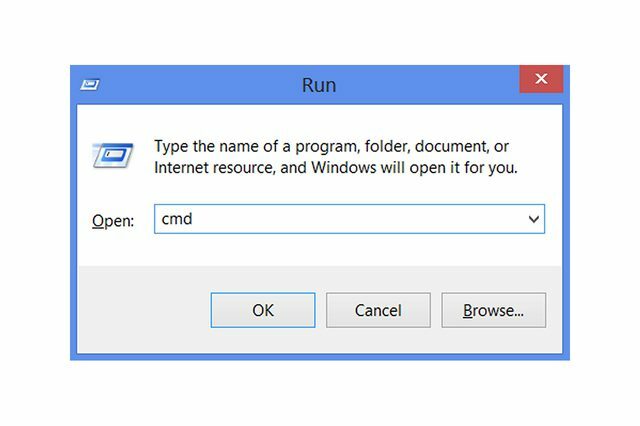 At First, close your Microsoft Outlook application and open File Explorer using Windows Key+E. 3. You will find a file named SCANPST.EXE. Double-click to Open it. 4. As the program starts to run, enter the name of .PST file you want to repair. You can also browse for the file instead of writing it manually. 5. After that, click on the Start button. 6. Afterwards, click on Repair button once the scanning is complete. 7. You can start working with Outlook once the process is complete. The error 0x8004010F: Outlook Data File Cannot be Accessed won’t come across you. It might be possible that the file that you are trying to use is not actually under your ownership, i.e., you might not have the permissions to read/write from/to the file. Because of this, there is a chance of Outlook Data File Cannot be Accessed error. To fix this, you need to have ownership of that file and that can do as follows. 1. At First, locate the file you are trying to use and right-click on it. 2. Then click on the Properties option from the menu. 3. Navigate to Security tab and then click the Advanced button. 4. Afterwards, check the Owner section of the file. If it’s set to an unknown user name, click on the Change link. 5. 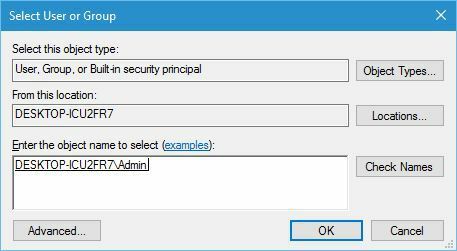 In the Enter object name to select enter your username and then click on Check Names. If your user name correct, click on OK. However, if it is not right, you must have made some spelling mistake in entering the username. Correct that and try again. 6. Now, the owner section would change to your username. Don’t forget to assign Full Control to this account. Click Apply and then on OK to save changes. The Cached Exchange Mode can interfere with the Microsoft Outlook and thus, result into causing Outlook Data File Cannot be Accessed error. So, to fix the problem, this mode should disable. To disable the Cached Exchange Mode, follow the steps mentioned below. 1. At First, open Microsoft Outlook on your system. 2. 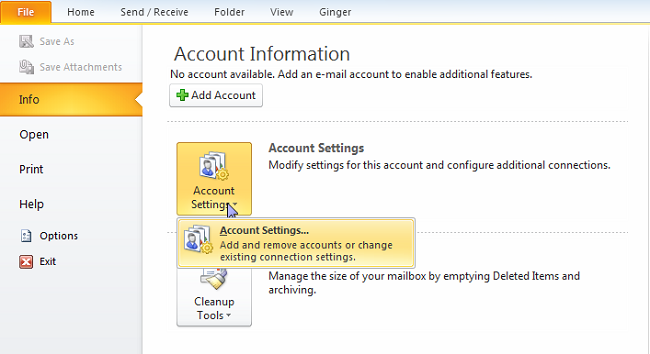 Then navigate to File>>Account Settings>>Account Settings. 3. Then select the Exchange or Office 365 account and click Change. 4. Now, just uncheck Use Cached Exchange Mode. 5. Afterwards, click on Next & then Finish. 6. Finally, restart Outlook application and you can work with it. 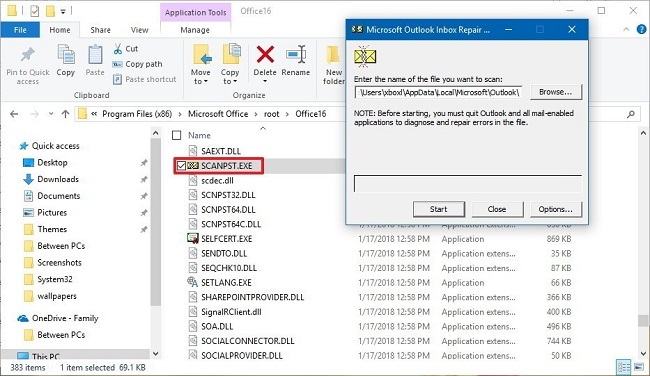 So far, we have established that the main reason for the 0x8004010F: Outlook Data File Cannot be Accessed error occurs because of corruption of Outlook data files. However, there can be some other reason possible too and all such reasons are mentioned above. These were some methods to resolve the 0x8004010F: Outlook Data File Cannot be Accessed error and thus, use them to solve your error. Hope you found these methods useful and therefore, use them to fix the error and get a swift use of Microsoft Outlook. Stay updated. 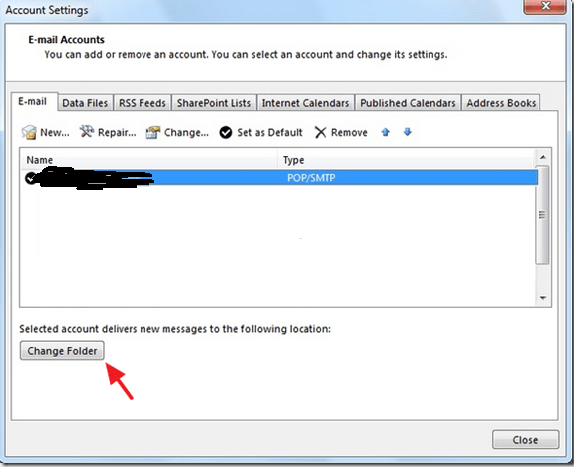 1 When Does Error 0x8004010F: Outlook Data File Cannot be Accessed Occur? 2 Why Does Error 0x8004010F: Outlook Data File Cannot be AccessedOccur? 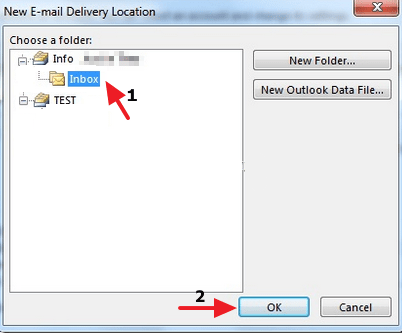 3 How to Fix Error 0x8004010F: Outlook Data File Cannot be Accessed Error?